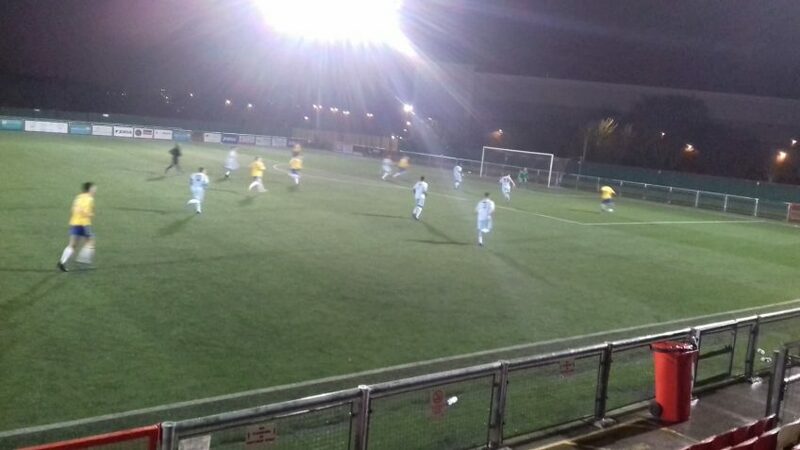 Clinical finishing was all the difference at on Tuesday evening as Woodford Town put Barkingside to the sword, although the game was not as one-sided as the score line suggests as Barkingside fought tooth and nail with their higher-placed opponents. In fact Side came out of the blocks in buoyant mood with Mario Gjini having an early shot tipped away by Alex Reed, while Dan Jones flashed one across Woodford’s goal inside the opening few minutes. The Woods went on to launch an attack themselves in the 5th minute and from this took the lead as Vlad Sighiartau latched onto a through ball and stroked it past Ryan Karrer. After that the game then became end-to-end as both teams looked to get the ball down and play, meaning that Reed had to be called upon to cut out shots from Isaac Marfo and Henry Matthews, while Woodford’s pace caused Side’s defence plenty of problems. A Taku Mashingaidze cross ricocheted off two Side defenders and was nearly turned in by Sighiartau, while an Alan Fleming shot curled just wide of Karrer’s right hand post. Good work by Gjini saw him lay off Marfo, who hit a powerful shot that Reed saved. And as the half closed it was Barkingside that were creating the better chances. Matthews had a low shot tipped away by Reed, then Joe Oates just failed to get his head onto a cross, with Jones having a second bite but could only skew his effort wide. The Woods opened the second period with the bit between their teeth and won an early corner after Andrea Mantovani passed to Fleming whose shot was deflected away. The pressure continued to build and it was no surprise when Woodford Town extended their lead in the 53rd minute; a pinpoint ball into the box was whipped into the bottom left hand corner by Mashingaidze. Barkingside had to find a way to get back into the game, but where kept on the back foot as Woodford Town pressed forward. A teasing cross by Morgan Seaman was cleared by Charlie Hay: a timely intervention as Fleming was loitering ominously at the back post. Then Karrer had to leap high to catch a Mantonvani cross that swept into his six-yard box. The Side keeper had to be at his best to parry a sizzling shot by Ethan Kessel; then had to ride his luck as Kessel pounced on the rebound, which hit the post. The Woods were able to have one further bite from this one chance as the ball fell to Sighiartau who had a poke, but Karrer was equal to it, pulling of a fantastic save to tip the ball over the bar. Side were able to finally get on the front foot, with a well worked move ending with David Hornsby picking out Gjini whose shot was blocked and then cleared. Hornsby was to have a better effort, turning and hitting a low shot that brought a great save from Reed who dived at full-stretch to tip the ball around the post. The subsequent corner was met by a powerful Derek Ohalem header that flew into the net. With 78 minutes played it meant that Barkingside had found themselves a lifeline. A minute later and that was ripped away when a defensive slip up was punished by Temi Babalola who side-footed the loose ball home at close range. Karrer used his feet to block a Samir Ali shot after a cheeky back-heel from Babalola had carved out a scoring opportunity. But the Woods were able to score once more, in the 87th minute when Kessel fired home to complete a fine win for the Woods which keeps them 5th going into Saturday’s fixtures. Barkingside gave a good account of themselves here, but the set back keeps them six points away from the teams just above them in the drop zone. Woodford Town: Alex Reed, Bailey Brown, Morgan Seaman, Malaki Toussaint (Connor Leon 66’), Joshua Steele, Alex Grosvenor (Capt), Taku Mashingaidze, Ethan Kessel, Alan Fleming (Samir Ali 75’), Vlad Sighiartau, Andrea Mantovani (Temi Babalola 66’). Scorers – Vlad Sighiartau (5’), Taku Mashingaidze (53’), Ethan Kessel (87’). Barkingside: Ryan Karrer, Frederico Hernandez (Abdul Musah 59’), George Woodward, Joe Oates (Edward Buchannen 85’), Charlie Hay, Derek Ohalem, David Ottley, Dan Jones, Mario Gjini, Henry Matthews, Isaac Marfo (66’). Scorer – Derek Ohalem (78’).